This is my brand new ESP Horizon Custom. Thanks to CMI here in Melbourne I am now an ESP endorser and this guitar is going to be my main instrument from now on. Hand crafted by Makoto Suzuki and the master luthiers at ESP Japan, this guitar is as beautiful to play as it is to look at. Expect it to feature heavily on all future live gigs and recordings. Hey, we all KNOW what it looks, sounds and plays like but we can’t actually say it otherwise a whole bunch of big, expensive, corporate lawyers will come around and kill me! I got this guitar after I stowed away on a visit to Japan with a bunch of fine players and teachers from Musicians Institute, one of whom was TJ Helmerich. The ESP people treated us tremendously and as a gift for our efforts we were allowed to choose an instrument so to show my gratitude I’ve been playing it almost exclusively for the past 6 or 7 years. This is another Jon Suhr neck, big baseball bat piece of maple and the pickups are all DiMarzio virtual vintage. I drew the guy on it but I have no idea who he’s supposed to be. Probably a self-portrait! I think I got this guitar around 1976 or so. After playing a few nasty cheapo guitars for a while I knew that music was going to be a permanent part of my life so I persuaded my mother to throw down about $650 for it. Turned out to be a really good investment as it lasted me through all the Black Dog years as well as all the early John Farnham stuff. I’ve since replaced the original neck (I still have it) with a solid maple neck made by Jon Suhr and the original pickups have been replaced with DiMarzio Virtual Vintage pickups. Now THIS is one beautiful instrument! A composite body and neck with the most incredible maple top and neck inlay work I've ever seen. This guitar is fitted out with DiMarzio pickups (Air Norton in the bridge, hot rails in the middle and Steve’s Special in the neck) but it also has a piezo system for an acoustic output and also the full MIDI system so I can trigger synth sounds. It's got to be the most effortless and comfortable instrument I've ever played and is a prized possession. The bridge is locked after numerous attempts to keep it in tune (not Brian Moore's fault!) and signaled the end of whammy bars for me. Ayers is a new Australian company led by master luthier Gerard Gilet and this instrument reflects that. Incredibly affordable with a full rich sound, I'm very lucky to have this instrument. It'll be getting a sound thrashing over the next few years! I've been great friends with Linda and Neville at Maton Australia for quite a few years now and their guitars are without exception are of a world-class quality. The onboard pickups are amazing and I constantly had sound guys all over the US asking me what kind of guitar it was and marveling at how incredible it sounded from the PA. I was lucky enough to play a Maton Messiah on John Farnham's "The Last Time" tour and they almost had to hold me at gunpoint to give it back! I played the prototype for this model on the Nelson video for "More Than Ever", the first (and probably only) time this instrument has been on television. To my knowledge, myself and Buckethead are the only people to play these in public but I could be wrong. It's the only model Steinberger ever made with a headstock and the tuning heads are a work of pure genius, not to mention the Trans-Trem which is a testament to the brilliance and vision of Ned Steinberger. The body is probably ash and the neck is solid graphite. 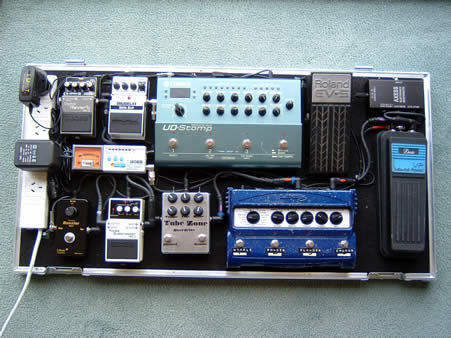 It now has a Fernandez Sustainer pickup system which I really find useful and is all over the Big Sky album. 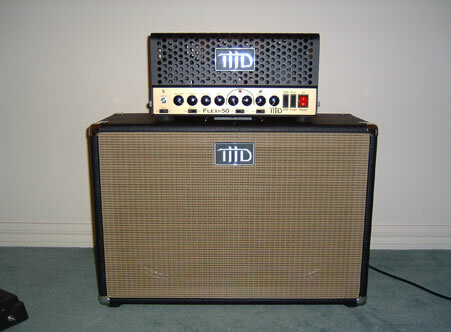 The THD line is the brainchild of Andy Marshall who I met through my good mate Ed DeGenero (a fellow Steinberger GS player). This particular amp allows you to use ANY combination of tubes you can imagine and re-bias them yourself so you can basically change them on the spot. The harmonic resonance of the amp and responsiveness is out of this world. The cab is a 2x12 loaded with Celestion Vintage 30s. All effects are running in-line as listed.